We have all seen the YouTube-films of people going completely nuts because their computer won’t do what they want it to. We also understand the irritations that can give rise to this behaviour. Sometimes it’s your computer that won’t do what you want, sometimes it’s a website that drives you crazy. The last thing that you want as a commercial organisation is for your website to be the cause of people shouting and swearing, and becoming aggressive with their computers. You can be quite sure that you will never see that irritated customer again, and the chances are that this will result in you receiving the worst word-of-mouth advertising you can imagine. Luckily there are countless resources available these days for monitoring customer experience, and provided we use these resources the right way we can prevent or remedy a lot of irritations. We have put together a top 10 of irritations based on the customer feedback that we collect for our clients. Most of the feedback that we receive relates to reporting bugs on sites (20%), but that does not mean that reports of bugs represent the most important irritation factor. If we combine the absolute figures with an analysis of feelings, so the extent to which people are really upset about a problem, then we see that of those 20% only 30% express a negative opinion. 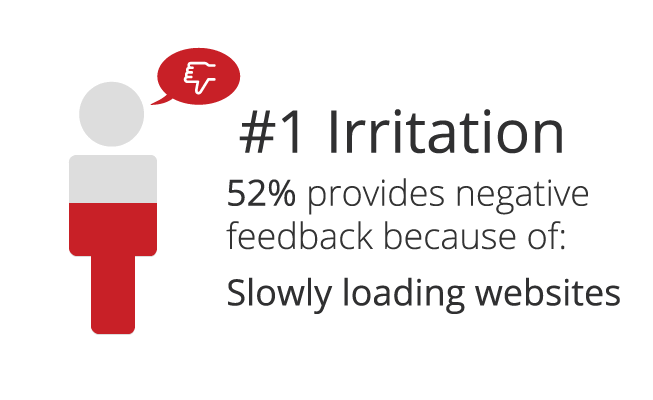 On the other hand problems with the loading speed of sites only make up 6.7% of the total feedback, but they clearly irritate people more: at least 58% of that feedback is negative. 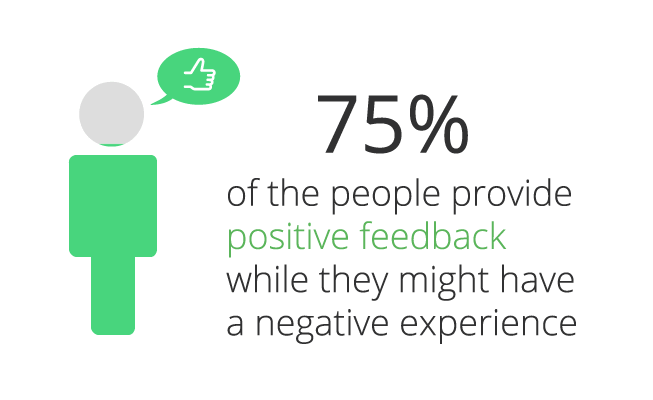 On average approximately quarter of the feedback from visitors to websites is negative. The other three quarters is therefore positive feedback. That means that people run into a problem somewhere, for example information that cannot be found or problems logging in, but that they don’t let it get to them. Collecting feedback also involves qualitative information and insights which are hidden away within open commentary, like suggestions and complaints. The aim is that you should learn from the comments and the feedback, so if you are unable to draw any conclusions it is a waste of time and energy. It is also important to receive feedback from as many respondents as possible – after all you can’t improve your processes on the basis of just a few opinions. You can find useful answers by combining the statistics with qualitative data, so that after a period of time you can see whether the improvements that have been implemented and the insights that you have gained actually lead to better results. The value of feedback does not lie in the quantity of feedback that you collect, but in the actions that you take in response to it. Fortunately one of the benefits of modern feedback technology is that you can easily zoom in on the matters that you wish to improve on your site. Think about what you wish to achieve and what the internal consequences might be for the organisation. Start a discussion with the teams within your organisation; talk about the possible outcomes and the benefits of obtaining new insights. And don’t forget to share the successes that result from this – both internally and with your customers.